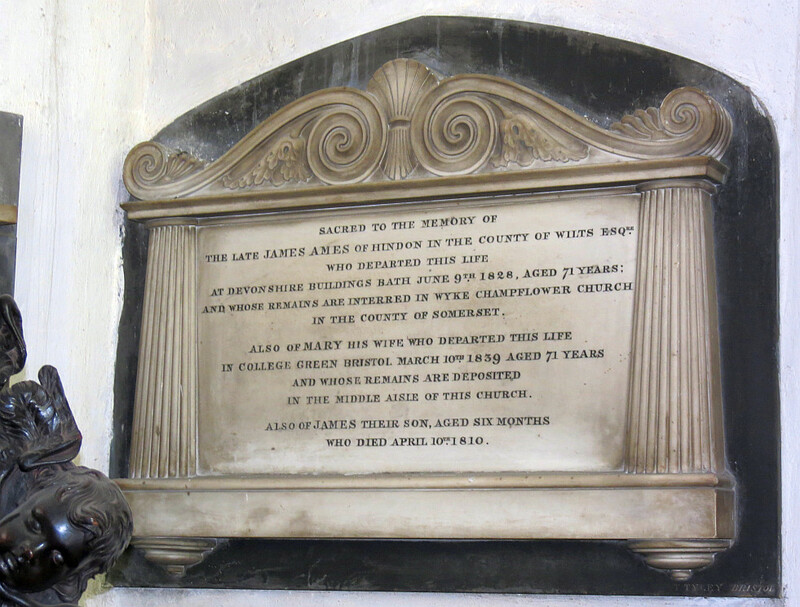 James Ames monument by Tyley of Bristol . Bristol has been a large, prosperous city since the 18th Century, and supported a goodly number of local monumental mason-sculptors, among which the family of Tyley rank high. The first significant member of the family was Thomas Tyley, and there was at least one further Thomas, and there is also a James Tyley and a W. Tyley. Work by the various Tyleys may be found in several Bristol churches, and more widely across South West England and further afield, dating from the very end of the 18th Century all the way through to about 1890. Of the ones I have seen, the most sculptural have been in Bristol Cathedral, of which the John Campbell monument (d.1819) has a seated female figure in high relief which is particularly elegant in composition, and the George Rogers monument of two decades later is a nice example of use of the broken pillar to indicate cessation of the male line. A different sort of monument – the Woolner-style classical relief portrait – is found in the Revd. John Eagles monument, d.1855. 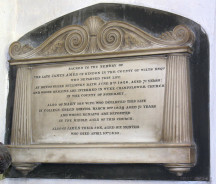 Among several monuments in St Stephen’s Parish Church by the Tyleys is a fine example with fluted pilasters and scrolly pediment, to James Ames , d.1828, by one of the Thomas Tyleys. Christ Church and St Ewen has a monument with an elegant quatrefoil to Revd. Robert Watson , d.1842. A late example of their work is the monument to Robert Henry Webb , d.1875, in St James Priory, in a Norman window style. The firm also produced completely plain mason’s work, as in the monuments to Eunice Jennings in St Stephen’s, and Thomas Roberts in St James Priory. I would not presume to have seen enough to come to any views on the merits and characteristics of the different family members, especially as some monuments are simply signed ‘Tyley, Bristol’, but as a broad generalisation, it seems clear that the family prided themselves on the quality of their workmanship, and their monuments are generally both well cut and competent in design.